The surgery will be closed from 12.30pm on Wednesday 24th April for GP and Staff Training . For emergencies after 12.30pm please contact the 111 service. 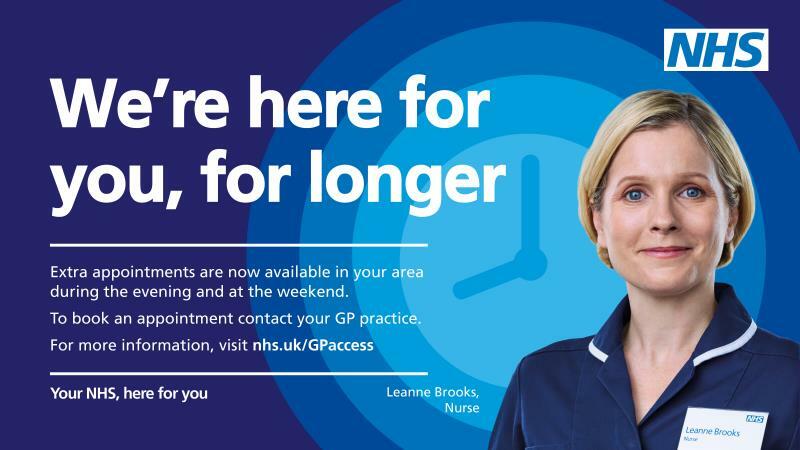 In the UK, More than 15 million general practice appointments are being wasted each year because patients do not turn up and fail to warn surgeries that they will not be attending. Each appointment costs an average of £30, putting the total cost to the NHS at more than £216 million pounds, on top of the disruption for staff and fellow patients. At Bethesda Medical Centre alone, approximately 4,586 appointments were missed in the past 12 months, costing the NHS approximately £121,920. Please make every effort to attend your appointments, or simply cancel them if they are no longer needed. It is only fair to your fellow patients and staff. Please remember that 3 missed appointments within a 6 month period will mean automatic removal from our surgery list, with a requirement to register elsewhere. !!! Exciting New Development Proposed - Planning Permission approved!!! As you might have seen in the media Bethesda Medical Centre is planning an exciting development over the next two years. We are planning to expand the current Surgery to incorporate more facilities for our patients and also we are working towards a merger with Northdown Surgery. We will be updating our website on a regular basis to keep you updated on what is happening. Please see the attached planning permission decision notice. Please also see the Building Progress tab (to the right of the screen) under Further Information - which shows drawings of the proposed new build. We – and our CCG is very much a part of this - are developing a Health and Social Care Sustainability and Transformation Plan (STP) that will set out how we think services need to change over the next five years to achieve the right care for people for decades to come. It will build on the work already underway in our CCG to strengthen primary care resilience and local care – the care people can get out of hospital. To find out more, please click on the link below Transforming health and social care in Kent and Medway, which sets out more about what we want to achieve and our areas of focus. A survey for the public and a set of frequently asked questions are on our website. We want to know if you need information in braille, large print or easy read. We want to know if you need a British Sign Language interpretor or advocate. Please tell the Receptionists when you arrive for your next appointment. The NHS in Kent and Medway has a free website and app to help you find the right treatment, especially when you are not sure what to do or who to contact. Whether you have a baby with a high temperature, a child who is being sick, a teenager who is feeling low or you have sprained your ankle and for many other health problems, the Health Help Now web app can guide you to the service that will help you best. New features available on the Apple and Android versions include a health wallet, where users can make notes about symptoms or questions they may need to ask a GP, keep a list of health appointments and contacts, save favourite pages from Health Help Now and view other useful apps. Health Help Now lists common symptoms for people of all ages and helps you find the best place for treatment for them in the local area. It shows the nearest services, whether they are open or closed, and provides a map of their location and directions. Health Help Now also offers reliable health advice and links to other useful websites. Available at www.healthhelpnow-nhs.net, it works on smartphones, tablets, and computers. To find the downloadable apps, just search Health Help Now at the Apple Store and the Android Google Play Store. Why not download it to your device now so you have it to hand when you need it? If you don’t have internet access, or if you need medical help fast but it isn’t a 999 emergency, dial 111. Health Help Now has been used more than 85,000 times since its launch, helping people to find the right treatment in the right place. It is an app and website which matches services to symptoms and shows which services are open and where they are. It can help people find out if they need to see a doctor, pharmacist or use a minor injuries service. Our team are here to treat those minor ailments that occur as well as providing specialist management of long-term conditions and clinics covering a wide range of healthcare issues. The technology also means you can now do a lot of things from the comfort of your home such as order a repeat prescription or cancel an appointment. If you would like to sign up to this service please ask at Reception or contact the Surgery on 209300.